A Member State that considers its territory or part of territory free from one or more of the diseases listed in Annex A, column I, list III to Directive 91/67/EEC, may under Article 13 of that Directive submit the evidence supporting the claim of freedom of diseases to the Commission for the purpose of being granted disease-free status. Denmark, Finland, Ireland, Sweden and the United Kingdom have submitted such claims to the Commission. A Member State that draws up a programme to control with a view to eradicating one or more of the diseases listed in Annex A, column I, list III to Directive 91/67/EEC, may under Article 12 of that Directive submit the programme to the Commission for approval. Finland, Ireland, Sweden and the United Kingdom have submitted such programmes to the Commission. Council Regulation (EEC) No 706/73 of 12 March 1973 concerning the Community arrangements applicable to the Channel Islands and the Isle of Man for trade in agricultural products (3), lays down that veterinary legislation is to apply to those islands under the same conditions as in the United Kingdom for the products imported into those islands or exported from them to the Community. It is necessary to establish the requirements to be fulfilled for Member States to be declared disease-free and the criteria the Member States are to apply under the control and eradication programmes. It is also necessary to define the additional guarantees which are required for the introduction of certain fish species into the disease-free zones and the zones concerned by the control and eradication programmes. For those purposes the recommendations of the World Organisation of Animal Health (OIE) should be taken into account. Denmark has submitted evidence of freedom from spring viraemia of carp (SVC), and should therefore be considered free from that disease. Finland has submitted evidence of freedom from SVC for its entire territory, and of freedom from Gyrodactylus salaris and infectious pancreatic necrosis (IPN) for parts of its territory. The territories concerned should therefore be considered free from those diseases. Finland has also submitted a programme for the control and eradication of bacterial kidney disease (BKD) which will apply to the continental parts of its territory. That programme should be approved with a view to eradicating the disease and achieving disease free status. Ireland has submitted evidence of freedom from SVC, BKD and Gyrodactylus salaris for its entire territory, and should therefore be considered free from those diseases. Sweden has submitted evidence of freedom from SVC and IPN for its entire territory, and should therefore be considered free from those diseases. Sweden has also submitted a programme for the control and eradication of BKD which will apply to the continental parts of its territory. That programme should be approved with a view to eradicating the disease and achieving disease free status. The United Kingdom has submitted evidence of freedom from Gyrodactylus salaris for its entire territory and of freedom from IPN, BKD and SVC for parts of its territory. The territories concerned should therefore be considered free from those diseases. The United Kingdom has also submitted programmes for the control and eradication of SVC and BKD applicable to other parts of its territory. Those programmes should be approved with a view to eradicating the diseases and achieving disease free status. The additional guarantees provided for by this Decision should be reconsidered after three years, taking into account the experience gained in relation to control and eradication of the diseases and the development of alternative control measures such as vaccines. Additional guarantees as regards SVC have been defined for certain fish species for consignment to Great Britain, Northern Ireland, the Isle of Man and Guernsey by Commission Decision 93/44/EC (4). That Decision should be repealed and replaced by this Decision. Commission Decision 2003/513/EC (5) is a safeguard decision protecting certain regions of the Community against introduction of Gyrodactylus salaris. Those measures have been in force since 1996, and are by their very nature additional guarantees and not safeguard measures. Decision 2003/513/EC should therefore also be repealed and replaced by this Decision. The guarantees laid down in Decisions 93/44/EC and 2003/513/EC should be updated to take into account the present scientific knowledge and current recommendations of the World Organisation of Animal Health (OIE). The measures provided for in this Decision are in accordance with the opinion of the Scientific Committee for the Food Chain and Animal Health. The requirements to be fulfilled in order for territory to be considered free of one or more of the diseases listed in Column I, List III of Annex A to Directive 91/67/EEC, are laid down in Annex I, Chapter I to this Decision. The territories listed in Annex I, Chapter II to this Decision are considered to be free from the diseases listed in Column I, List III of Annex A to Directive 91/67/EEC. The criteria a Member States shall apply under a control and eradication programme for one or more of the diseases referred to in Column I, List III of Annex A to Directive 91/67/EEC, are laid down in Annex II, Chapter I to this Decision. The control and eradication programmes for the territories listed in Annex II, Chapter II to this Decision are approved. 1. Live aquaculture fish, eggs and gametes which are introduced into the territories listed in Annex I, Chapter II or Annex II, Chapter II, shall comply with the guarantees, including those for packaging and labelling and the appropriate specific additional requirements, as laid down in the health certificate, drawn up in conformity with model health certificate in Annex III, taking into account the explanatory notes in Annex IV. 2. 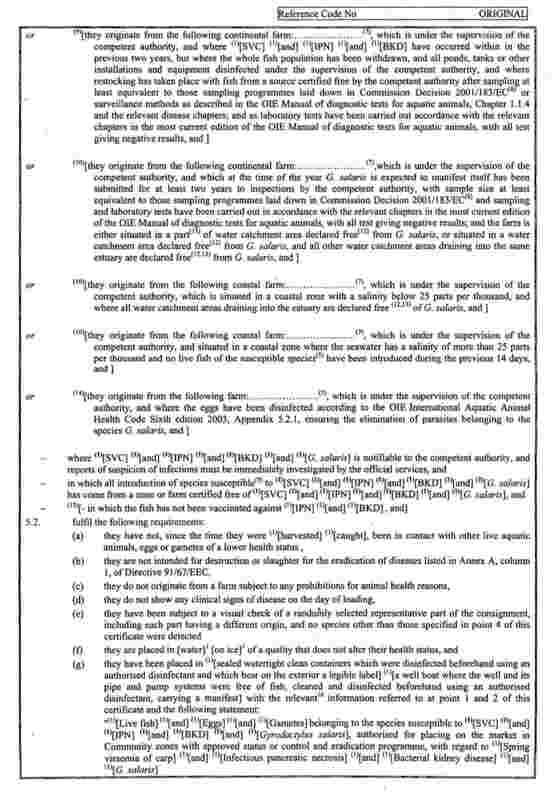 The requirements laid down in paragraph 1 shall not apply when eggs are introduced into the territories listed in Annex I, Chapter II or Annex II, Chapter II, for the purpose of human consumption. 3. The additional guarantees should be maintained when the requirements laid down in Annex V are fulfilled. Live aquaculture fish, eggs and gametes introduced into the territories listed in Annex I Chapter II, or Annex II Chapter II, shall be transported under conditions not altering their-health status and not jeopardising the health status at the place of destination. Decisions 93/44/EC and 2003/513/EC are repealed. The Commission shall review the additional guarantees laid down by this Decision by 30 April 2007 at the latest. The review shall take account of the experience gained in relation to control and eradication of the diseases and the development of alternative control measures such as vaccines. (1) OJ L 46, 19.2.1991, p. 1. Directive as last amended by Regulation 806/2003 (OJ L 122,16.5.2003 p. 1). (2) OJ L 224, 18.8.1990, p. 24. Directive as last amended by Directive 2002/33/EC of the European Parliament and of the Council (OJ L 315,19.11.2002, p. 14). (3) OJ L 68, 15.3.1973, p. 1. Regulation as amended by Regulation (EEC) No 1274/86 (OJ L 107, 24.4.1986, p. 1). (4) OJ L 16, 25.1.1993, p. 53. Decision amended by Decision 94/865/EC (OJ L 352, 31.12.1994, p. 75). (5) OJ L 177, 16.7.2003, p. 22. A Member State shall be considered free of a disease if none of the susceptible species are present or if it meets the conditions in point 1) or 2) below. If a Member State shares a water catchment area with one or more other Member States, it can only be declared a disease free country if all the shared water catchment areas are declared disease-free zones in both Member States. conditions applied to trade and imports to prevent the introduction of the disease into the Member State are in place. targeted surveillance has been in place for at least the past 2 years in aquaculture establishments holding any of the susceptible species without detection of the disease agent. If there are areas of the country in which surveillance in aquaculture establishments only, does not give sufficient epidemiological data (where the number of aquaculture establishments are limited), but in which there are wild populations of any of the susceptible species, those wild populations must be included in the targeted surveillance. The sampling methods and sample sizes should be at least equivalent to those laid down in Commission Decision 2001/183/EC or in the relevant chapters of the OIE International Aquatic Animal Health Code and OIE Manual of Diagnostic Tests for Aquatic Animals. The diagnostic methods should be at least equivalent to those laid down in the relevant chapters of the OIE Manual for diagnostic tests in aquatic animals. A disease-free zone may be established within the territory of one Member State of infected or unknown status for a disease, if none of the susceptible species are present in the zone, or if the zone meets the conditions referred to in point 1 or 2 below. Such disease-free zones must comprise: one or more entire water-catchment area(s) from the sources of the waterways to the sea, or part of a catchment area from the source(s) to a natural or artificial barrier that prevents the upward migration of fish from lower stretches of the waterway. Such zones must be clearly delineated on a map of the territory of the country concerned by the Competent Authority. If a water-catchment area extends over more than one Member State, it can only be declared a disease free zone if the conditions outlined below apply to all areas of the zone. Both Member States concerned should apply for approval of the zone. conditions applied to trade and imports to prevent the introduction of the disease into the zone are in place. targeted surveillance has been in place for at least the past 2 years in aquaculture establishments holding any of the susceptible species without detection of the disease agent. If surveillance in aquaculture establishments only, does not give sufficient epidemiological data (where the number of aquaculture establishments are limited), but in which there are wild populations of any of the susceptible species, those wild populations must be included in the targeted surveillance. The sampling methods and sample sizes should be at least equivalent to those laid down in Commission Decision 2001/183/EC or in the relevant chapters of the OIE International Aquatic Animal Health Code and OIE Manual of Diagnostic Tests for Aquatic Animals. The diagnostic methods should be at least equivalent to those laid down in the relevant chapters of the OIE Manual for diagnostic tests in aquatic animals. Whole territory; the water catchment area of River Vuoksi should be considered as buffer zone. The continental parts of the territory; the water catchment areas of River Vuoksi and River Kemijoki should be considered as buffer zones. The water catchment areas of Tenojoki and Näätämönjoki; the water catchment areas of Paatsjoki, Luttojoki, and Uutuanjoki are considered as buffer zones. The territories of Great Britain, Northern Ireland, The Isle of Man, Jersey and Guernsey. The disease must be compulsorily notifiable to the Competent Authority, including notification of suspicion. access by the Competent Authority to laboratories with the facilities for diagnosing and differentiating the disease in question. Conditions to trade and imports to prevent the introduction of the disease into the Member State must be in place in place. Targeted surveillance must been in place in aquaculture establishments holding any of the susceptible species. If there are areas of the country in which surveillance in aquaculture establishments only, does not give sufficient epidemiological data (where the number of aquaculture establishments are limited), but in which there are wild populations of any of the susceptible species, those wild populations must be included in the targeted surveillance. The sampling methods and sample sizes should be at least equivalent to those laid down in Commission Decision 2001/183/EC or in the relevant chapters of the OIE International Aquatic Animal Health Code and OIE Manual of Diagnostic Tests for Aquatic Animals. The diagnostic methods should be at least equivalent to those laid down in the relevant chapters of the OIE Manual for diagnostic tests in aquatic animals. The control and eradication programme should continue until the requirements in Annex I have been fulfilled, and the Member State or parts thereof could be considered free of the disease. Appropriate samples are taken for examinations with a view of establish the presence of the pathogen in question. Pending the result of the examination referred to in point 1, the competent authority shall place the farm under official surveillance and relevant control measures must be implemented and no fish should leave the affected farm, unless authorised by the official service. If the examination referred to in point 1 show the presence of a pathogen or clinical signs, an epizootic investigation must be carried out by the official service in order to determine the possible means of contamination and to investigate whether fish have left the farm, during the relevant period preceding observation of the suspicion. no fish, eggs or gametes leave these farms without the authorisation of the official service. In the case of extensive water catchment areas or coastal areas, the official service may decide to limit this measure to a less extensive area close to the farm suspected of being infected, if it considers that this area affords maximum guarantees for the prevention of the spread of the disease. The farm or site containing the infected fish is immediately placed under restrictions and no live fish is moved into the premises, and no fish is moved out of the farm unless authorised by the official services in the Member State. Fallowing of the farm or site (and where appropriate disinfection) for an appropriate period following withdrawal, taking into consideration Section 1.7 of the most current edition of the OIE International Aquatic Animal Health Code. Removal and destruction of dead fish and fish displaying clinical signs of disease, in the case of sites where withdrawal and/or disinfection may not be possible because of the nature of the site (e.g. a river system or extensive lake). To facilitate a swift and rapid eradication of the disease from infected premises, the competent authority of the Member State may allow fish not displaying clinical signs of disease to be transported - under the supervision of the competent authority - to other farms or areas within the Member State in question that is not covered by disease free status or an approved control and eradication programme. Fish removed and disposed of as a consequence of the action in paragraphs 2.1 and 2.2 must be disposed of in accordance with Regulation 1774/2002. Fish used to re-stock sites must originate from certified disease free sources. Member States shall take the necessary measures to prevent the spreading of the disease to other farmed fish or wild stocks. The continental parts of the territory. The movement documents shall be produced by the competent authorities of the Member State of origin, based on the model appearing in Annex I to this Decision taking into account the species of the consignment and the status of the place of destination. The original of each movement document shall consist of a single page, double-sided, or, where more than one page is required, it shall be in such a form that all pages form part of an integrated whole and are indivisible. It shall, on the right hand side of the top of each page, be marked as "original" and bear a specific code number issued by the competent authority. All pages of the movement document shall be numbered - (page number) of (total number of pages). The original of the movement document and the labels referred to in the model movement document shall be drawn up in at least one official language of the Member State of destination. However, Member States may allow other languages, if necessary, accompanied by an official translation. 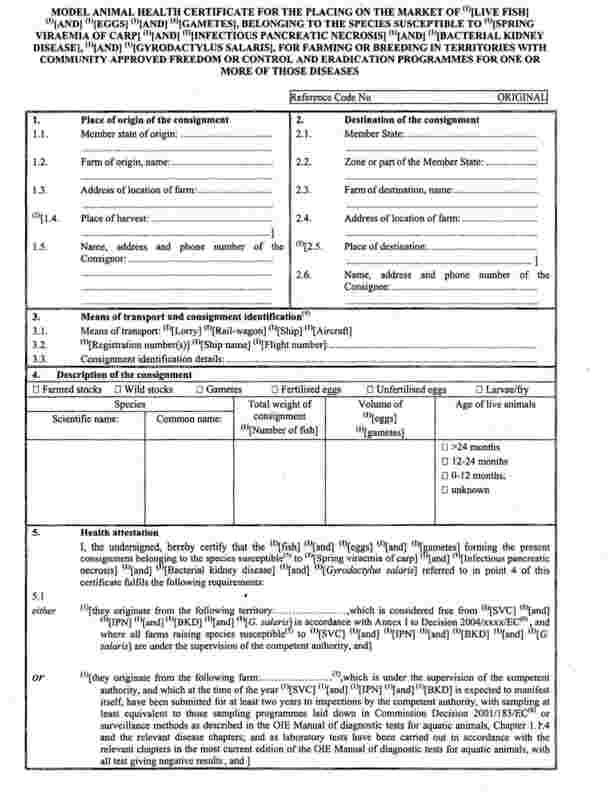 The original of the movement document must be completed, on the day of loading of the consignment, with an official stamp and signed by an official inspector designated by the competent authority. In doing so, the competent authority of the Member State of origin shall ensure that the principles of certification equivalent to those laid down in Council Directive 96/93/EC are followed. The stamp, unless embossed, and the signature shall be in a colour different to that of the printing. If for reasons of identification of the items of the consignment, additional pages are attached to the movement document, these pages shall be considered as forming part of the original and be signed and stamped by the certifying official inspector on each page. The original of the movement document must accompany the consignment until it reaches the place of destination. The movement document shall be valid for 10 days from the date of issue. In the case of transport by ship, the time of validity is prolonged by the time of journey at sea. The aquatic animals, their eggs and gametes, shall not be transported together with other aquatic animals or their eggs and gametes that are of a lower health status. Furthermore, they must not be transported under any other conditions that alter their health status or could jeopardise the health status at the place of destination. All farms having species susceptible to the disease, to which the Member State has been granted free status, must be under the supervision of the competent authority. Conditions to trade and imports as well as management of wild fish stocks of the susceptible species, to prevent the introduction of the disease in question into the Member State or parts thereof covered by this Decision must be in place. Fish originating in coastal zones should not be introduced into continental zones, unless authorised by the competent authority of the Member State of destination. In Member States where only parts of territory is declared free according to Annex I, Chapter II (not whole territory is declared free), targeted surveillance must been maintained in accordance with the provisions of Annex II, Chapter 1.4 in the areas declared free. Live aquaculture fish, eggs and gametes introduced into the territories listed in Annex I Chapter II, or Annex II Chapter II, shall be transported under conditions not altering their health status and not jeopardising the health status at the place of destination. The transport shall take place in water considered free from the disease in question as it is taken from the water source of the farm or site of origin, and that water exchange during transport is done only at places authorised by the competent authority of the Member State of destination, where appropriate in collaboration with the competent authority of the Member State of origin. Vaccination against the disease in question shall not take place. Before 1 May each year submit a report to the Commission giving information on the number of suspicions, the number confirmations, the number of farms and sites under restrictions, the number of restrictions lifted and the result of any active surveillance performed the previous calendar year according to the following table. Fallowing, and where appropriate disinfection, of the farm or site for an appropriate period following withdrawal, taking into consideration Section 1.7 of the most current edition of the OIE International Aquatic Animal Health Code. 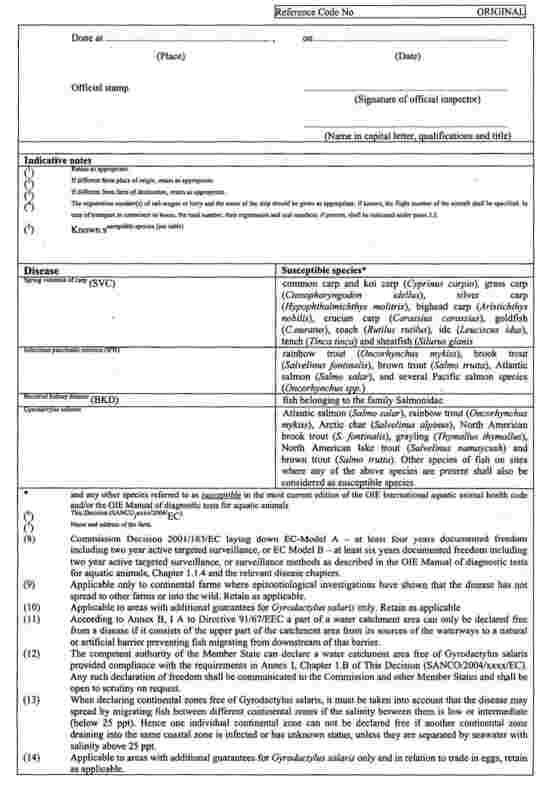 When the Member State has eradicated the disease from a continental farm according to Point C 2.1 of this Annex, and the epizootic investigations required in Point B 3 of this Annex concludes that the disease has not spread to other farms or into the wild, disease free status is reinstated immediately. Otherwise, the disease free status could only be reinstated after compliance with Annex I.